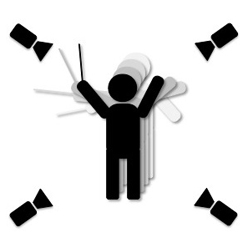 How to capture conducting motion? 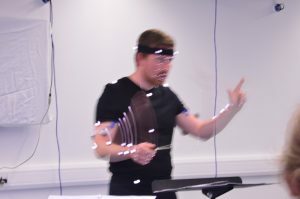 This pilot study will use motion capture technology to help in the development of tools for the modelling and analysis of contemporary conducting gesture both for conductor performance studies and real-time gesture control in electroacoustic music performance. We intend to develop a protocol for the use of high-end, high- resolution marker-based motion capture systems (such as those used for computer generated graphics in cinema) to record precise 3D representations of conducting gestures. This high-quality data will be able to demonstrate even subtle differences between performances, musical contexts and conductors. 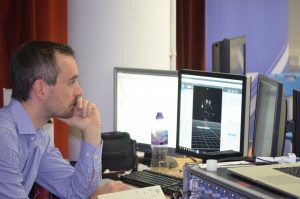 The project brings together expertise in the fields of conducting, music technology and biomechanics to deliver both a methodology for conducting motion capture, and motion data sets, with audio and video recordings, for study by the team and others through open online access. 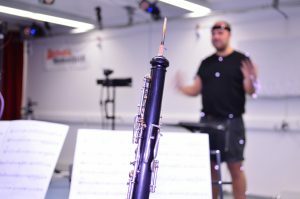 This data will provide new information to help analyse the complex relationship between the conductor and instrumentalists, as well as training data for gesture recognition systems. This project is funded by the British Academy and the Leverhulme Trust.